Heat oven to 350°F. In 12-inch nonstick skillet, heat 1 tablespoon of the oil over medium heat. 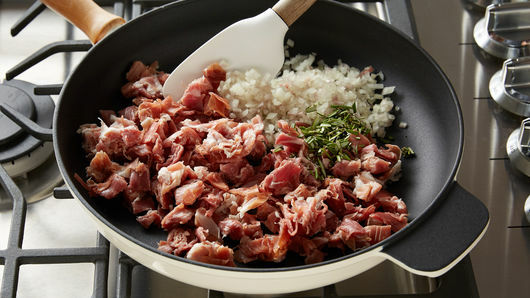 Add prosciutto, shallots and chopped rosemary; cook 6 to 8 minutes, stirring constantly, until shallots are tender and prosciutto is browned. Spread 4 tablespoons of the oil over bottom of 13x9-inch pan; sprinkle with 1/8 teaspoon of the garlic salt. Unroll 1 can of dough; place in pan. Gently stretch and press dough to cover bottom of pan. Make impressions over top of dough with fingertips. 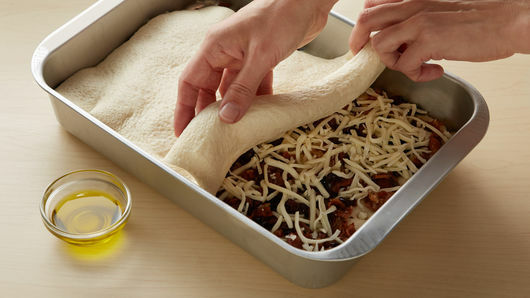 Spread prosciutto mixture evenly over dough; sprinkle with olives and cheese. Unroll remaining can of dough; carefully place over filling in pan. Drizzle with 2 tablespoons oil; carefully stretch to sides of pan to cover filling completely. 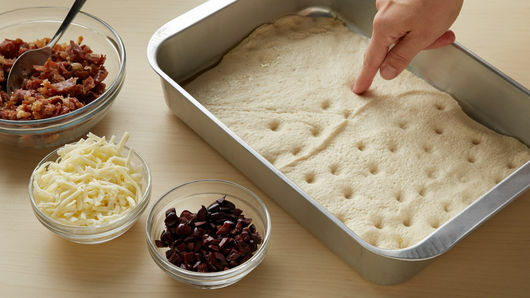 Make impressions over top of dough with fingertips. Sprinkle with remaining 1/8 teaspoon garlic salt. Bake 32 to 36 minutes or until golden brown. Drizzle with remaining 1 tablespoon oil. If desired, sprinkle with additional rosemary leaves. Let stand 5 minutes. To serve, cut into 4 rows by 4 rows. Growing up, my grandmother, Nonie, was my world. She taught me to garden, sew, cook, and—my favorite Nonie pastime—bake. My mom was a single mom and worked full-time as a teacher. Nonie filled in to help when mom was working or (understandably) too exhausted from raising us kids and working. I spent a lot of time in Nonie's kitchen watching her effortlessly turn out one delicious family recipe after another—recipes all passed down from her mother. 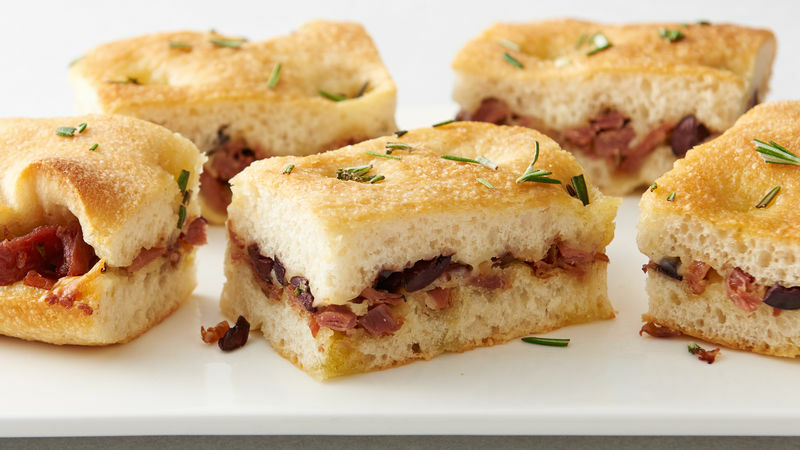 Two of my favorite appetizer treats Nonie would make were focaccia (she called it "Italian bread") and antipasto, which was made up of plates filled with Italian meats, cheese and olives that we cured in her kitchen. Years later, when I had my two children and was a busy single mom, Nonie and I made focaccia and antipasto whenever I visited (I moved 3,000 miles away). Nonie is now gone, and I miss her terribly, but I am still baking her focaccia with my own updated recipe using Pillsbury™ refrigerated classic pizza crust. And, I've elevated the recipe to include my second favorite appetizer: antipasto. This recipe is enjoyed by my growing family every time my kids visit (life goes in a full circle; one child now lives 3,000 miles away). This is the first year we will not all be spending Thanksgiving together, but I'll be making this recipe for my new husband and my kids will be making it for their new family of friends. This recipe is not just filled with memories, it is filled with flavor. All of the ingredients are easily found in any grocery store, the steps are easy and fast and the result is a true show stopper. I hope you enjoy my family's Focaccia Antipasto.